In this article, I want to take you through an example project that I built recently — a totally original type of visualization using the D3 library, which showcases how each of these components add up to make D3 a great library to learn. If you’ve ever seen any of the fabulous interactive stories from the New York Times, you’ll already have seen D3 in action. You can also see some cool examples of great projects that have been built with D3 here. The learning curve is pretty steep for getting started with the library, since D3 has a few special quirks that you probably won’t have seen before. However, if you can get past the first phase of learning enough D3 to be dangerous, then you’ll soon be able to build some really cool stuff for yourself. Flexibility. D3 lets you take any kind of data, and directly associate it with shapes in the browser window. This data can be absolutely anything, allowing for a huge array of interesting use cases to create completely original visualizations. Elegance. It’s easy to add interactive elements with smooth transitions between updates. The library is written beautifully, and once you get the hang of the syntax, it’s easy to keep your code clean and tidy. Community. There’s a vast ecosystem of fantastic developers using D3 already, who readily share their code online. You can use sites like bl.ocks.org and blockbuilder.org to quickly find pre-written code by others, and copy these snippets directly into your own projects. 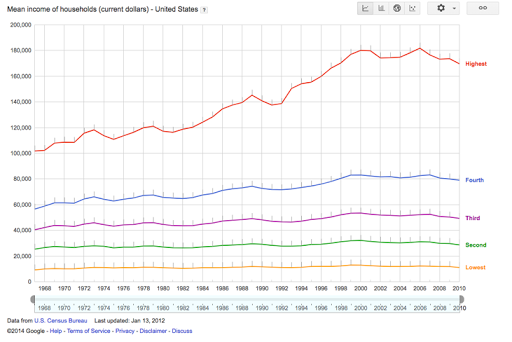 As an economics major in college, I had always been interested in income inequality. I took a few classes on the subject, and it struck me as something that wasn’t fully understood to the degree that it should be. When you adjust for inflation, household income has stayed pretty much constant for the bottom 40% of society, although per-worker productivity has been skyrocketing. It’s only really been the top 20% that have reaped more of the benefits (and within that bracket, the difference is even more shocking if you look at the top 5%). Here was a message that I wanted to get across in a convincing way, which provided a perfect opportunity to use some D3.js, so I started sketching up a few ideas. Because we’re working with D3, I could more or less just start sketching out absolutely anything that I could think of. Making a simple line graph, bar chart, or bubble chart would have been easy enough, but I wanted to make something different. I find that the most common analogy that people tended to use as a counterargument to concerns about inequality is that “if the pie gets bigger, then there’s more to go around”. The intuition is that, if the total share of GDP manages to increase by a large extent, then even if some people are getting a thinner slice of pie, then they’ll still be better off. However, as we can see, it’s totally possible for the pie to get bigger and for people to be getting less of it overall. The idea would be that we’d have this pulsating pie chart, with each slice representing a fifth of the US income distribution. The area of each pie slice would relate to how much income that segment of the population is taking in, and the total area of the chart would represent its total GDP. Here, it actually looks like the poorest Americans are getting richer over time, which confirms what seems to be intuitively true. I thought about this problem some more, and my solution involved keeping the angle of each arc constant, with the radius of each arc changing dynamically. 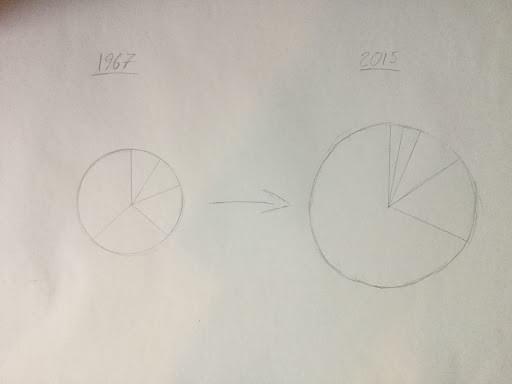 However, I was committed to making a unique visualization, and I wanted to hammer home this message that the pie can get bigger, whilst a share of it can get smaller. Now that I had my idea, it was time to build it with D3. So, now that I know what I’m going to build, it’s time to get into the real meat of this project, and start writing some code. You might think that I’d start by writing my first few lines of code from scratch, but you’d be wrong. This is D3, and since we’re working with D3, we can always find some pre-written code from the community to start us off. This file is written in D3 V3, which is now two versions out of date, since version 5 was finally released last month. A big change in D3 V4 was that the library switched to using a flat namespace, so that scale functions like d3.scale.ordinal() are written like d3.scaleOrdinal() instead. In version 5, the biggest change was that data loading functions are now structured as Promises, which makes it easier to handle multiple datasets at once. To avoid confusion, I’ve already gone through the trouble of creating an updated V5 version of this code, which I’ve saved on blockbuilder.org. I’ve also converted the syntax to fit with ES6 conventions, such as switching ES5 anonymous functions to arrow functions. I then copied these files into my working directory, and made sure that I could replicate everything on my own machine. If you want to follow along with this tutorial yourself, then you can clone this project from our GitHub repo. You can start with the code in the file starter.html. Please note that you will need a server (such as this one) to run this code, as under the hood it relies on the Fetch API to retrieve the data. Let me give you a quick rundown of how this code is working. This makes our code super reusable, since if we ever want to make it bigger or smaller, then we only need to worry about changing these values right here. We’re grabbing hold of an empty div with the ID of chart-area with a call to d3.select(). We’re also attaching an SVG canvas with the d3.append() method, and we’re setting some dimensions for its width and height using the d3.attr() method. We’re also attaching an SVG group element to this canvas, which is a special type of element that we can use to structure elements together. This allows us to shift our entire visualization into the center of the screen, using the group element’s transform attribute. In D3, layouts are special functions that we can call on a set of data. A layout function takes in an array of data in a particular format, and spits out a transformed array with some automatically generated values, which we can then do something with. We then need to define a path generator that we can use to draw our arcs. Path generators allow us to draw path SVGs in a web browser. All that D3 really does is to associate pieces of data with shapes on the screen, but in this case, we want to define a more complicated shape than just a simple circle or square. Path SVGs work by defining a route for a line to be drawn between, which we can define with its d attribute. The d attribute contains a special encoding that lets the browser draw the path that we want. If you really want to know what this string means, you can find out about it in MDN’s SVG documentation. For programming in D3, we don’t really need to know anything about this special encoding, since we have generators that will spit out our d attributes for us, which we just need to initialize with some simple parameters. For our chart, we’re using a value of zero for our innerRadius, which gives us a standard pie chart. 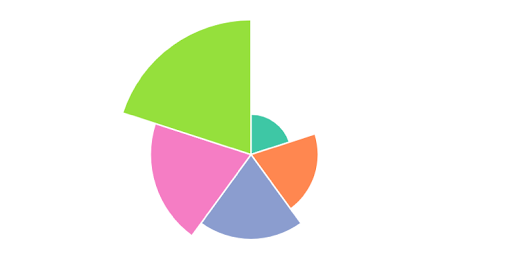 However, if we wanted to draw a donut chart instead, then all we would need to do is plug in a value that’s smaller than our outerRadius value. In D3 version 5.x, a call to d3.json() returns a Promise, meaning that D3 will fetch the contents of the JSON file that it finds at the relative path that we give it, and execute the function that we’re calling in the then() method once it’s been loaded in. We then have access to the object that we’re looking at in the data argument of our callback. Our data is split into two different arrays here, representing our data for apples and oranges, respectively. We’ll also need to call the update() function on the first run of our visualization, passing in an initial value (with our “apples” array). Firstly, we’re using a default function parameter for value. If we’re passing in an argument to our update() function (when we’re running it for the first time), we’ll use that string, or otherwise we’ll get the value that we want from the click event of our radio inputs. We’re then using the General Update Pattern in D3 to handle the behavior of our arcs. This usually involves performing a data join, exiting old elements, updating existing elements on the screen, and adding in new elements that were added to our data. In this example, we don’t need to worry about exiting elements, since we always have the same number of pie slices on the screen. Every time our visualization updates, this associates a new array of data with our SVGs on the screen. We’re passing our data (either the array for “apples” or “oranges”) into our pie() layout function, which is computing some start and end angles, which can be used to draw our arcs. This path variable now contains a special virtual selection of all of the arcs on the screen. We’re using the attrTween() method on the d3.transition() call to define a custom transition that D3 should use to update the positions of each of its arcs (transitioning with the d attribute). We don’t need to do this if we’re trying to add a transition to most of our attributes, but we need to do this for transitioning between different paths. D3 can’t really figure out how to transition between custom paths, so we’re using the arcTween() function to let D3 know how each of our paths should be drawn at every moment in time. We’re using d3.interpolate() here to create what’s called an interpolator. When we call the function that we’re storing in the i variable with a value between 0 and 1, we’ll get back a value that’s somewhere between this._current and a. 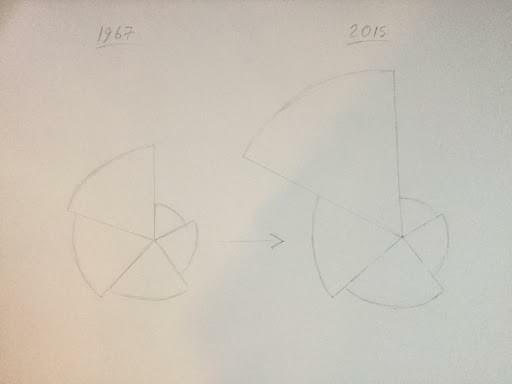 In this case, this._current is an object that contains the start and end angle of the pie slice that we’re looking at, and a represents the new datapoint that we’re updating to. Once we have the interpolator set up, we’re updating the this._current value to contain the value that we’ll have at the end (i(a)), and then we’re returning a function that will calculate the path that our arc should contain, based on this t value. Our transition will run this function on every tick of its clock (passing in an argument between 0 and 1), and this code will mean that our transition will know where our arcs should be drawn at any point in time. This block of code will set the initial positions of each of our arcs, the first time that this update function is run. The enter() method here gives us all the elements in our data that need to be added to the screen, and then we can loop over each of these elements with the attr() methods, to set the fill and position of each of our arcs. We’re also giving each of our arcs a white border, which makes our chart look a little neater. Finally, we’re setting the this._current property of each of these arcs as the initial value of the item in our data, which we’re using in the arcTween() function. Don’t worry if you can’t follow exactly how this is working, as it’s a fairly advanced topic in D3. The great thing about this library is that you don’t need to know all of its inner workings to create some powerful stuff with it. As long as you can understand the bits that you need to change, then it’s fine to abstract some of the details that aren’t completely essential. Now that we have some code in our local environment, and we understand what it’s doing, I’m going to switch out the data that we’re looking at, so that it works with the data that we’re interested in. This function does basically the same thing as d3.json() — converting our data into a format that we can use. I’m also removing the type() initializer function as the second argument here, since that was specific to our old data. We have an array of 50 items, with each item representing a year in our data. For each year, we then have an object, with data for each of the five income groups, as well as a few other fields. 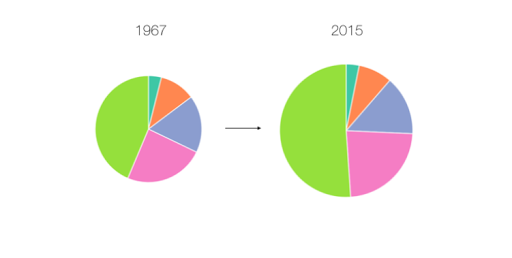 We could create a pie chart here for one of these years, but first we’ll need to shuffle around our data a little, so that it’s in the right format. When we want to write a data join with D3, we need to pass in an array, where each item will be tied to an SVG. Recall that, in our last example, we had an array with an item for every pie slice that we wanted to display on the screen. Compare this to what we have at the moment, which is an object with the keys of 1 to 5 representing each pie slice that we want to draw. For every year, this function will return an object with a values array, which we’ll pass into our data join. We’re labelling each of these values with a name field, and we’re giving them a numerical value based on the income values that we had already. We’re also keeping track of the average income in each year for comparison. I’ll start off by generating a chart for the first year in our data, and then I’ll worry about updating it for the rest of the years. We’re adding this scale as soon as we have access to our data and we’re saying that our input should range between 0 and the largest value in our dataset, which is the income from the richest group in the last year in our data (data.values.value). For the domain, we’re setting the interval that our output value should range between. This means that an input of zero should give us a pixel value of zero, and an input of the largest value in our data should give us a value of half the value of our width or height — whichever is smaller. Notice that we’re also using a square root scale here. The reason we’re doing this is that we want the area of our pie slices to be proportional to the income of each of our groups, rather than the radius. Since area = πr2, we need to use a square root scale to account for this. Whenever our data changes, this will edit the radius value that we want to use for each of our arcs. We’re structuring our page here using Bootstrap’s grid system, which lets us neatly format our page elements into boxes. I’m using the Array.forEach() method to accomplish this, although I could have also gone with D3’s usual General Update Pattern again (JOIN/EXIT/UPDATE/ENTER). I should note that it’s important for us to add each of these circles after our first call to update(), because otherwise they’ll end up being rendered behind each of our arc paths (SVG layers are determined by the order in which they’re added to the screen, rather than by their z-index). As a last step, I want us to add in some controls to let the user dig down into a particular year. I want to add in a Play/Pause button, as well as a year slider, allowing the user to pick a particular date to look at. We’ll need to add some event listeners to both of these elements, to engineer the behavior that we’re looking for. First off, I want to define the behavior of our Play/Pause button. We’ll need to replace the code that we wrote for our interval earlier to allow us to stop and start the timer with the button. I’ll assume that the visualization starts in a “Paused” state, and that we need to press this button to kick things off. Whenever our button gets clicked, our if/else block here is going to define a different behavior, depending on whether our button is a “Play” button or a “Pause” button. If the button that we’re clicking says “Play”, we’ll change the button to a “Pause” button, and start our interval loop going. Alternatively, if the button is a “Pause” button, we’ll change its text to “Play”, and we’ll use the clearInterval() function to stop the loop from running. Here, we’re using the slide option to attach an event listener to the slider. Whenever our slider gets moved to another value, we’re updating our timer to this new value, and we’re running our update() function at that year in our data. And there we have it — our finished product — a fully functioning interactive data visualization, with everything working as expected. Hopefully, this tutorial demonstrated the real power of D3, letting you create absolutely anything you can imagine. An overview of SitePoint’s D3.js content. The introduction to the library on D3’s homepage. This runs through some of the most basic commands, showing you how to make your first few steps in D3. “Let’s Make a Bar Chart” by Mike Bostock — the creator of D3 — showing beginners how to make one of the simplest graphs in the library. D3.js in Action by Elijah Meeks ($35), which is a solid introductory textbook that goes into a lot of detail. D3’s Slack channel is very welcoming to newcomers to D3. It also has a “learning materials” section with a collection of great resources. The multitude of example visualizations that are available at bl.ocks.org and blockbuilder.org. The D3 API Reference, which gives a thorough technical explanation of everything that D3 has to offer. And don’t forget, if you want to see the finished version of the code that I was using in the article, then you can find it on our GitHub repo. Adam first fell in love with D3.js as an economics and computer science student at Harvard University. He now works as a data visualization engineer, helping companies from all around the world to find the best ways to display their data. He also teaches an online course on Udemy, offering students a comprehensive introduction to D3 over 93 video lectures. You can get the course for only $20 here.